Damn. I love me some pasta. Tomato sauce, pesto, peanut sauce, sign me up. But, I have never really been one for alfredo sauce. I don’t love stuff that is too creamy which may be why it was pretty easy for me to become vegan. But, if you have ever had the fettuccine alfredo at Earl’s you know that that is the good shiz. Cheesy, garlicy and delicious. 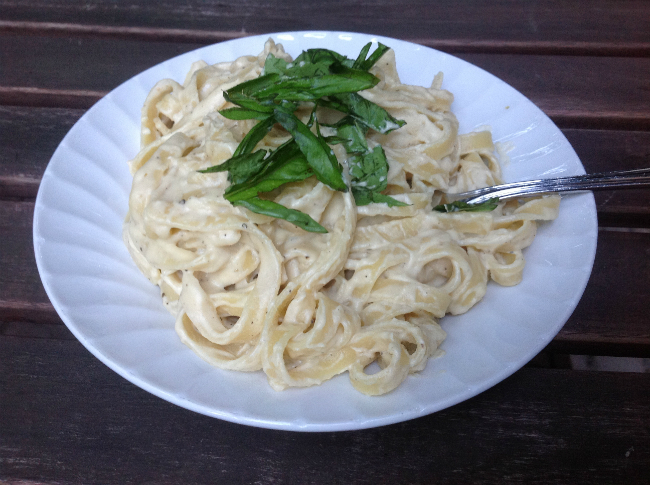 Inspired by that meal and my recent trip to heavy food world capital, France, I thought I would give a shot at veganizing fettuccine alfredo. This may not be a classic recipe from my mom, but I did grow up on bowls of this from Earl’s so it does have that nostalgia factor. And who says that summer is just for salads and burgers? Why not try a heavy bowl of pasta? Right? Boil the pasta until al dente, about 6-8 minutes. While the pasta cooks, combine the rest of the ingredients in a blender (excluding the basil). Continue to blend until creamy. Drain the pasta and then pour the pasta back into the pot. Pour some of the sauce over the pasta and return to heat to warm through. Add more sauce to the pot until it is to your liking. I don’t like my pasta to saucy. Serve the pasta and top with basil and vegan Parmesan or nutritional yeast. Cancel your evening plans because this is heavy! I do have a connection. I took you to Earl’s lol! Wow, this looks delicious and doesn’t even seem that difficult!